Japan trade deficits have turned into trade surpluses. Japan tax revenue is going up as spending goes down. Japan interest payments are decreasing. Bank of Japan starts tapering as fiscal situation improves. The Ministry of Finance Japan has released a draft budget for 2018 and that report on the fiscal situation can be found here. I'll summarize my findings in this article. First, let's focus on the trade and current account deficit in Japan. Both have been deteriorating rapidly in 2013, but since 2014 things have improved. Both the trade deficit and current account deficit have turned into surpluses. The latest current account number in October 2017 was a surplus of 2180 billion yen. The reason for this is that the U.S. stock market has been on a tear and Japan's current account has benefited from this (see chart below from tradingeconomics). Net primary income from direct investment in overseas assets and portfolio investment in stocks and bonds amounted to 18 trillion yen, or 3.3% of GDP. The trade balance has improved, because import costs for oil and gas have been low. The latest November trade surplus figure came in at 285 billion yen (see chart below from tradingeconomics). This number has improved since Japan's nuclear reactors started to come online in 2017-2018. If we then move on to the budget deficits, we see an improvement as well. 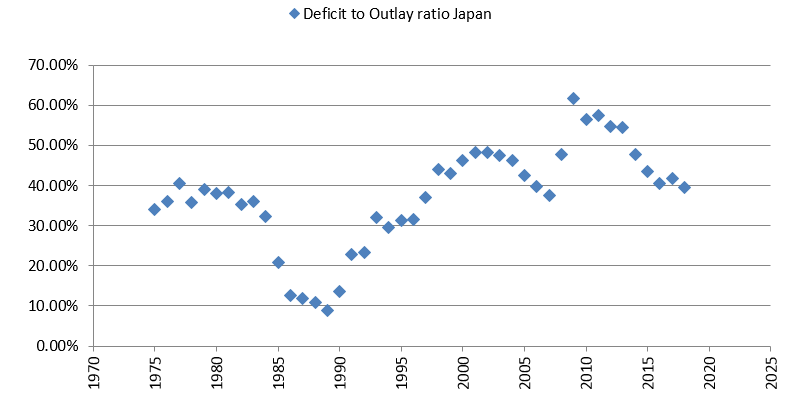 The deficit to outlay ratio (which gives the likelihood for hyperinflation) has come down from a peak of 62% to 40% (see chart below from Correlation Economics). The chart below (created by Correlation Economics) illustrates that the government has cut back on spending (red chart) and the budget deficits have come down as a result (green chart). Spending is estimated at 98 trillion yen in 2017. It also shows how tax revenues in Japan (blue chart) have gone up due to a rising Japanese stock market. Tax revenues are expected to come in at 59 billion yen this year, the highest since 1990. 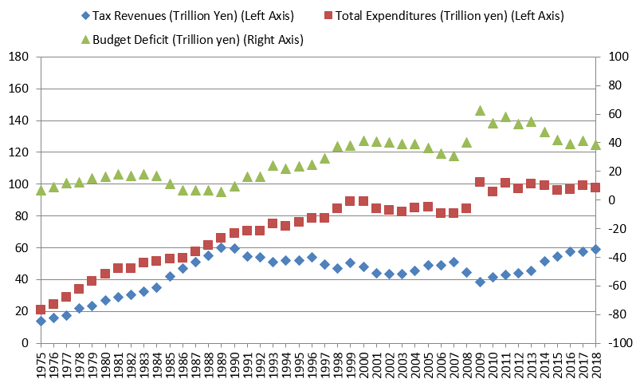 This rise in tax revenues has decreased the budget deficits in Japan. The trend has improved, but the budget deficit still tends to move upwards. Finally, let's have a look at the monetary policy and interest payments on government debt. As you know, the Bank of Japan is now implementing an unlimited bond buying scheme. In November, 2016, the central bank of Japan announced it will buy any amount of bonds to keep the 10 year bond yield at 0%. They are succeeding: 10 year Japanese bonds are still at 0%. The yen has underperformed since that announcement. This effect will be exacerbated as global bond yields are rising as we speak. Because bond yields are so low, interest payments are set to be very low for fiscal 2017 (9.03 trillion yen). 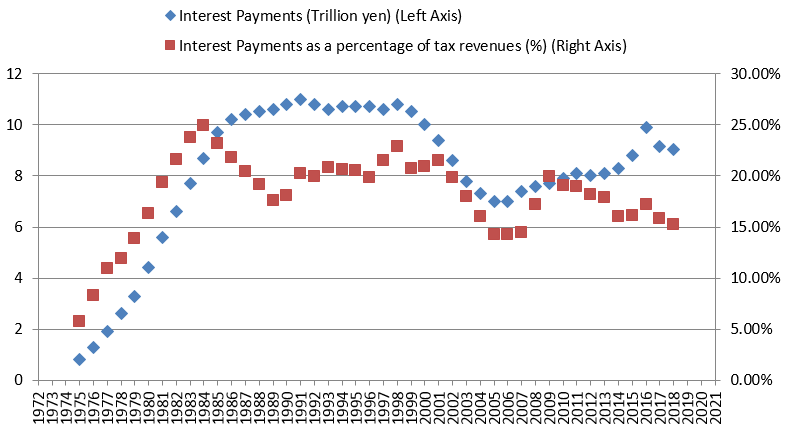 The interest payments as a percentage of tax revenue will drop to 15.27% (see chart below created by Correlation Economics). 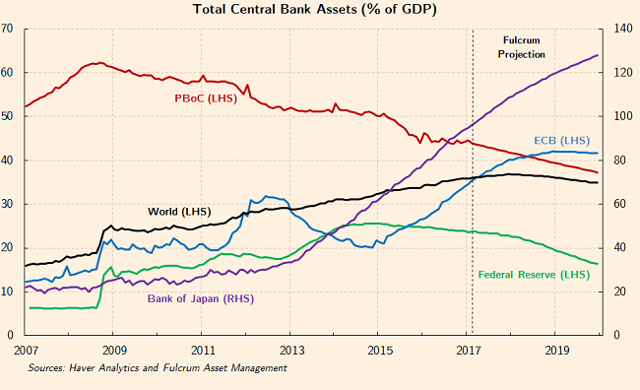 If we take a look at the Japanese central bank balance sheet, we can see that the Bank of Japan started to increase their asset purchases in 2013. The central bank bought approximately $600 billion/annum in assets from 2013 to 2016, which is 10% of its GDP (see chart below from Haver Analytics). They decreased the pace of buying to $450 billion in 2017. So the Bank of Japan is actually tapering now, following the ECB and the Federal Reserve. This is reasonable as the fiscal situation in Japan has improved markedly and the Nikkei is trading at year 2000 highs. The massive money printing from the Bank of Japan started in 2013 and has continued ever since. It effectively increased tax revenues through a higher stock market and trade deficits turned into trade surpluses. It did bring in a lower yield environment to spur economic growth. The 10 year bond yield is kept at 0% through an unlimited buying program announced in November 2016 and interest payments have gone down because of that. But it also had adverse consequences. The yen underperformed ever since that November announcement. When you bear in mind that global bond yields are moving up, Japan could be getting into a lot of trouble if it wants to keep bond yields where they are. That's why Japan has started to taper in 2017 as the balance sheet has only increased by $450 billion in 2017, down from $600 billion in 2013. This is a reasonable time to start tapering because the Japanese stock market is trading at year 2000 highs and the fiscal/economic situation has improved.